Gearing the public up to use the current debris flow and flood map was the object of a door-knock program the past two weekends. More than 100 volunteers fanned out across Montecito Saturday morning to deliver evacuation and disaster-preparedness information to residents living on properties deemed at risk for flooding and debris flows this rainy season. The door-to-door outreach was orchestrated by Santa Barbara County Search and Rescue and helped emergency responders make good on their “promise to hand deliver information to community members” after the release of updated flood and debris maps earlier this year, according to Division Chief Kevin Taylor with the Montecito Fire Protection District. 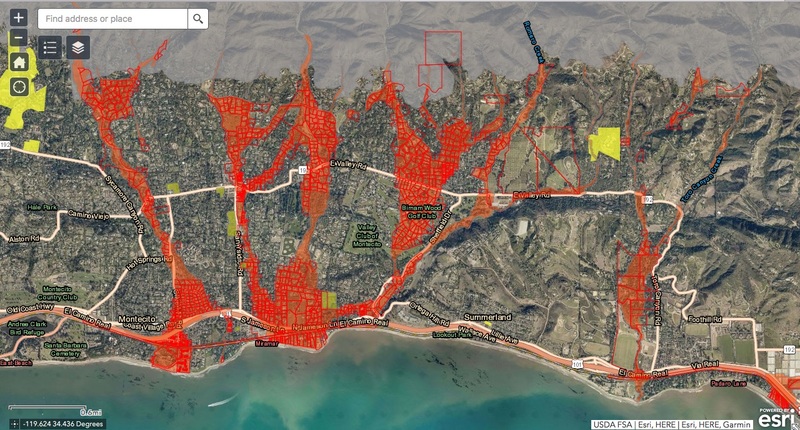 After a 9 a.m. sign-up and briefing at Montecito Union School, groups of three to four volunteers were given neighborhood assignments, where they went door-to-door throughout “red zones.” These parcels — mostly along creeks and low-lying areas prone to flooding — will be under mandatory evacuation ahead of intense rainstorms, according to an updated map recently released by Santa Barbara County Office of Emergency Management (OEM). That map can be viewed at readysbc.org. During the door-knock canvassing, if a resident was home, volunteers would recite a short script about the outreach effort and hand over a small tote filled with pamphlets — in English and Spanish — about storm readiness, the county’s Aware & Prepare notification system, and other information regarding emergency preparedness. If a resident was not home — or didn’t answer the door — volunteers would hang the totes on the front door or mailbox. Volunteers reached more than 1,300 addresses in less than three hours. Along the way, they tracked their progress with a smartphone app, dropping time-coded pins at each completed property. Nelson Trichler with County Search and Rescue explained that the data would help his teams have a firmer grasp of how long it would take to make similar neighborhood sweeps in an actual emergency. The outreach was also performed in Carpinteria on December 9, Trichler added, drawing roughly 60 volunteers. Joining Search and Rescue, OEM, and Montecito Fire, the coordinated effort included dozens of volunteers with the Santa Barbara Bucket Brigade, the Montecito Emergency Response and Recovery Action Group (MERRAG), and Habitat for Humanity.